DURYEA, PA – The Edge 3 with 4.5 mph iLevel® from Quantum Rehab® has been chosen as an HME Business 2018 New Product Award Winner. The Edge 3 with 4.5 mph iLevel won in the “Mobility – Power & Manual Wheelchairs” category. Winners were announced yesterday by HME Business magazine. Quantum and other winners will receive awards and be recognized at the 2018 Medtrade Fall Expo in Atlanta, which runs Oct. 16-17. They will also be featured on the HME Business website, www.hme-business.com, and will be featured in the November/December 2018 issue of HME Business magazine. The HME Business New Product Award, which is in its fifth year, honors outstanding product development achievements by HME manufacturers and service providers. The New Product Award entries are judged by an impartial panel of judges from the HME provider community. 4.5 mph iLevel option, standard fender lights, standard USB device charger and standard drive- wheel accents corresponding with new shroud color choices. All enhancements were specifically market-driven. 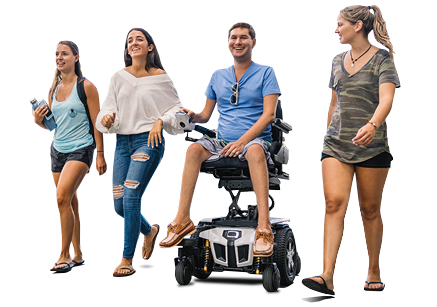 Quantum Rehab® is a premier global innovator of consumer-inspired complex rehab products, including the Edge 3, 4Front®, and Quantum Series of power bases, iLevel® seat elevation technology, TRU-Balance® 3 Power Positioning Systems, Q-Logic 3 Advanced Drive Controls, and Stealth Products® positioning components. Please visit quantumrehab.com.